Rear Admiral J. J. "Jocko" Clark and staff were allowed 30-days leave by Admiral Nimitz, and departed Pearl Harbor for the West Coast on October 5, 1944. While on the West Coast, Clark was contacted by Dwight Long, who had filmed a color documentary aboard the USS Yorktown and USS Ticonderoga. The title was "The Fighting Lady." It was produced by 20th Century-Fox. All profits would go to the Navy Relief Fund. The film was excellent. It factually represented carrier combat. But, its' release was blocked by Navy censor. The new censor, Captain Jack S. Phillips, disliked the name of the title, and the showing of radar antennae on a battleship. He believed this was a violation of security. Admiral Clark was in a position to help. He intervened, and the Navy Department released the film without change. The movie company released it to the public in January of 1945. On March 15, 1945 "The Fighting Lady" was awarded an Oscar for Best Documentary, Features at the Academy Awards. 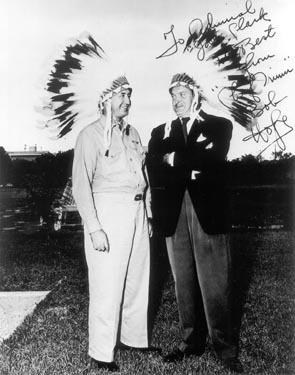 The above picture with Bob Hope was taken at some time during the portion of Clark's leave spent on the West Coast, and his involvement with release of "The Fighting Lady." Photograph of Admiral Clark and Bob Hope courtesy of William D. "Bill" Beatty nephew of Admiral Joseph James "Jocko" Clark. © 1999-2007 Utility Press Inc. All rights reserved. Copyright claim exclusive of photograph.